I’ve kind of given up on how to appropriately name these posts. So you get what you get. Anyway, here’s what we’ve been up to since the last update. Unceremoniously killed by the Met Council and Hennepin County. Read more about it here. We did meet with Congressman Keith Ellison who pledged his support to try to resolve this favorably for us. The project will be built with about a billion dollars in Federal cash, so hoping we have some leverage here. He already sent a letter on our behalf. More to come. We opted out, as I described here. Now on to developing a replacement ordinance. Installing the necessary road upgrades so we could get quiet zones so trains would not routinely sound their horns when crossing Douglas or West Broadway. This is still on the radar and progressing through the labyrinth of bureaucracies that have to approve of such a thing. Was great this year. I hear the fireworks were great. I was probably in bed. 10:00pm is way past this guy’s bedtime. I was in the dunk tank along with Mayor Adams, Councilmember Parsons, and a few city commissioners. We raised about $400 for local food shelves. Who Likes Big Trucks? Everyone. Well this is fun. 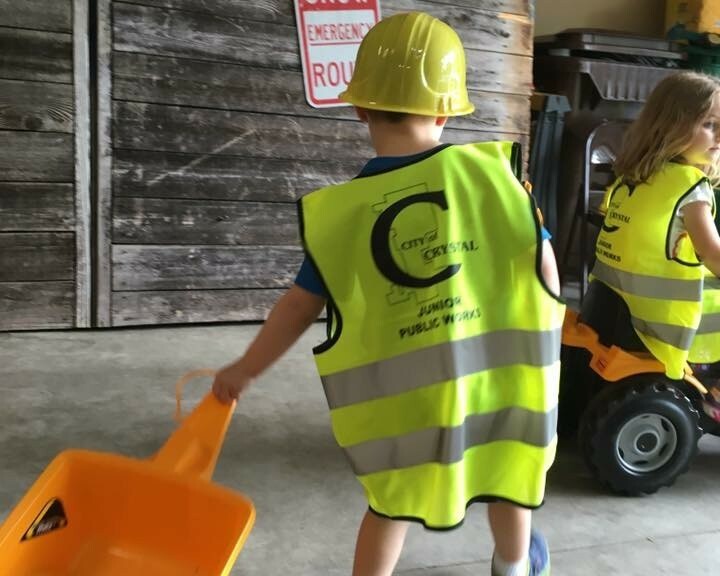 A local resident (that I happen to be married to) and mother of a truck-obsessed toddler contacted the public works department to see if they had ever considered renting out one of the rooms at the public works garage for kids’ birthday parties- including a tour of the building as part of the party. That proved too difficult to work out from a logistical and risk management standpoint, but the public works staff did come up with a neat concept where a truck could stop by and visit the kid’s house during the party, and public works would supply some fun props for photos. The resident would pay a fee to cover the staff time, etc. Community outreach + happy kids = win/win. We were the guinea pigs for the process, and worked out a few kinks, but based on the overall success I’d expect to see a public works party package available to Crystal residents soon. I offered that we could rent out council members for parties too, but was politely told that “council member in a late model Jeep Cherokee” didn’t have the same draw as “real life construction guy in a big truck”. The city budget process is underway, and things look ugly this year. We’re looking at sizable increases or drastic cuts. I’d like to sugarcoat it, but I can’t. Stay tuned. The preliminary levy gets passed in September. After that we can lower it but can’t raise it.